Browse through the website to view all kitchen door designs, finishes, popular ranges and accessories. Samples Colours can be posted to you for FREE. Refundable Sample Doors can be purchased for just £12.00 £5.99 inc P+P. To place your order call 01942 231500. Homestyle have the quickest leadtime in the industry, guaranteed. DIY installation will be a breeze because we will make your new kitchen doors and drawer fronts exactly the same size as your existing ones. The hinge holes can even be pre-drilled in the same place. The "Internet's most affordable door supplier"
HOMESTYLE was the first company offering replacement kitchen doors and accessories online. You will be amazed by our massive range, low prices and fast delivery service. 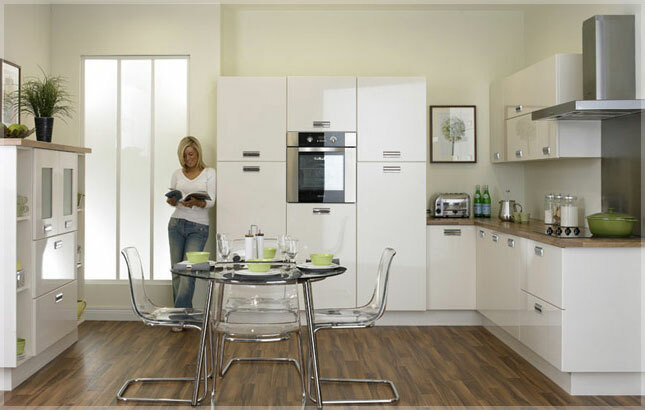 The kitchen shown is the Premier Duleek design in High Gloss Ivory finish. Transforming your kitchen is easy with Homestyle!